All The Write Stuff: Meet Paranormal and SF Author Phil Giunta! How exciting to have one of our own teaching at this year's "Write Stuff" Conference and what intriguing sessions you're teaching! Phil Giunta: My focus with “Time Management of Writers” will be guilt. Yes, guilt…and why you shouldn’t necessarily feel it when you don’t achieve a specific word count per day or find yourself unable to spare time on a daily basis or the words just don’t flow when you finally find that hour or two. Writing time can also be spent in other ways. Editing the previous day’s work or research are also valid uses of writing time. “The Differences Between Writing Novels and Short Stories” seem obvious, right? One is short, the other is long and that’s all folks, goodnight! Yet there are writers who have a challenging time keeping to word counts. Why is that? Well, there might be differences in the amount of characters needed to tell a story, the level of character development, character points of view, timeframe, pacing, and plotting. With novels you have a bit more elbow room than in short stories. However, there are no absolute hard and fast rules for much of what we’ll talk about and I definitely look forward to audience participation. I stake no claim on omniscience. Every writer has his or her own unique methods and experience and I find that many writers are eager to share, which I encourage. Your first book "Testing the Prisoner" presents an interesting combination about a person's innermost psychology and the paranormal. Seriously creepy stuff here. How did this story idea come to you? Phil Giunta: Testing the Prisoner began as a story of a broken family, child abuse, and—eventually—forgiveness. Suffice it to say that I have some personal experience in these matters and wanted to write a tale for all of those dealing with the same pain to let them know that they are not alone. However, as I began writing the outline, my fondness for the paranormal crept in and I realized that it would be more dramatically told as a ghost story. So we have Daniel, our protagonist, estranged from his abusive mother for over a decade. On the night he learns of her death, he finds himself haunted by an angel and a demon. He soon learns that each is a manifestation of his own personality. They battle for one purpose—to convince Daniel to either forgive his mother or not, thereby determining the fate of her soul. The victim has now become the judge, jury, and potential executioner. Yes, it’s creepy. It’s also emotional and dark, but is not personal experience often the source of an artist’s creativity? I recently read an article on The Creative Penn blog by Eric Praschan called “Using Real Life Fear and Pain to Springboard Your Story” and I firmly agree that if you can imbue in your characters the same emotions you felt while enduring a similar tribulation, the story will gain verisimilitude and truly reach your readers’ hearts. Out of curiosity, how did you first become interested with ghost stories and the paranormal? And may I ask, have you ever been part of a paranormal investigating team such as the one your heroine Miranda Lorensen had? Phil Giunta: I’ve always loved an atmospheric, suspenseful ghost story. Think of The Sixth Sense, What Lies Beneath, Stir of Echoes. By its very nature, the paranormal removes certain boundaries and in doing so, allows a writer to create scenarios and explore emotions not always possible in other genres. Ironically, other than Edgar Allan Poe and very few others, I rarely read paranormal fiction. SF is my first love and I am an avid reader of books from the golden age of SF (Asimov, Bradbury, Clarke, Heinlein, etc) and just beyond that era (Bova, Ellison, etc). In fact, I’m developing an SF novel right now. I can count on one hand how many paranormal investigations I’ve participated in and even those were years ago. I was never part of an organized group, just a few curiosity-seekers with still cameras and voice recorders. However, like any good writer, research was in order when it came to writing By Your Side. The television series, Ghost Hunters, and other shows provided some assistance to that end. Miranda had been a last-minute addition to Testing the Prisoner as Daniel’s old flame who also happened to be a psychic-medium. During a dinner scene, she mentions to Daniel that she belongs to a group of paranormal investigators. That, along with many other aspects of her character, led me to write By Your Side as a spin-off novel focusing on Miranda, her abilities, her team, and her life. Daniel’s story ended, but Miranda’s continues. I understand "Testing the Prisoner" is on Podiobooks and "By Your Side" is on Prometheus Radio Theatre. Can you tell us a little bit about what these are and the benefits you are seeing by being a part of it? Phil Giunta: A bit of background: My publisher for both novels is Firebringer Press, started by Steven H. Wilson. Steve created The Arbiter Chronicles, a podcast SF audio drama featuring a full cast of voice actors and earning him both the Mark Time and Parsec awards. Since he loves audio and has been podcasting for years, Steve encourages his prose writers to record their own audio books. Prometheus Radio Theatre is Steve’s podcast site where listeners can, free of charge, listen to episodes of any full cast audio show that he has produced as well as audio books written and read by those published via his imprint, Firebringer Press. Audio books are serialized; typically one chapter per week. Podiobooks.com offers all audio books free of charge. The site was founded by Evo Terra and Tee Morris. Tee, also a Parsec award winner, was the first writer to serialize a novel as a podcast audio book and Evo coined the term “podiobook”. Hence, the site was born and now hosts probably thousands of audio books. Evo and Tee also wrote Podcasting for Dummies. Many popular writers have their work on Podiobooks such as Scott Sigler, Nathan Lowell, and others. The largest benefit I’ve seen is promotion and exposure. Though we give away the audio books, they have generated sales of the ebooks and paperbacks from supportive listeners. As I’m still a newbie, I’m not yet seeing stunning sales as a result of the audio books, but like anything worthwhile, it takes time. I’m focused on the long tail. Beyond the above reasons, reading for audio is simply great fun, albeit time intensive for longer works. Listener feedback is often immediate. So far, I’ve been fortunate to receive many positive comments on my audio books. Testing the Prisoner’s audio book had its first run on Prometheus Radio Theatre before being uploaded to Podiobooks. By Your Side will eventually end up on Podiobooks as well. I understand you wrote fan fiction in the 1990s. Could you tell us a little about how this helped your writing and career? Do you think this contributed to writing the short stories in the ReDeus anthologies? Phil Giunta: These are two excellent questions and yes, they definitely relate. For those who need a definition of fan fiction (or fan fic), it is simply fans of already-established universes writing their own stories based on those characters. To me, fan fic was a great training ground to hone my writing and storytelling skills. Between 1995 and 2003, I wrote short stories in the universes of Star Trek, Star Wars, Indiana Jones, and several others. The feedback was overwhelmingly positive, but by 2003, I wanted to move on and pursue original stories with an eye toward getting published. Couple that with the fact that for 20 years, I’ve been attending SF conventions in Maryland where many of my favorite media tie-in writers are guests. In the early years, I would take my stack of Star Trek comics and novels and have them signed by folks like Peter David, Michael Jan Friedman, Bob Greenberger, Howard Weinstein, and others. Many of these writers would take the time to offer writing advice to me personally as well as host writing workshops and discussion panels at the conventions. Flash forward to 2012. I received an email from Bob Greenberger in June inviting me, and several other writers that attend the Maryland conventions (including Steve Wilson as he and Bob are longtime friends), to contribute stories to the ReDeus series (more details about ReDeus in the next question). Bob knew I had published my first novel a few years before and was now including me on a dream project. I was, and still am, deeply honored. Speaking of Crazy 8's ReDeus (the anthology depicting the world's mythological gods returning), mythology has always been one of my favorites! Do you have a favorite pantheon? Can you tell us how this anthology started? Phil Giunta: I’m not sure of the exact year when the project began, but the series is the brainchild of Bob Greenberger, Paul Kupperberg, and Aaron Rosenberg. The premise: what if all of the ancient gods from every pantheon returned at once? How would they look upon us now with our cars, aircraft, technology? How would they reinstate themselves as absolute rulers over their old domains? I was only able to participate in the first two volumes (Divine Tales and Beyond Borders). By the time the third book was open for submissions, I was on deadline to finish recording the audio book for By Your Side, working on a novella, and about three months away from my wedding. Alas, I could not commit to Native Lands. As for my favorite pantheon, I wrote about two: the Tuatha dé Danaan of Ireland and the little known Gaulish gods (of the Gaul Empire). I had so much fun with both stories that it’s challenging to pick a favorite. I will say that Irish mythology has a wealth of characters to choose from whereas much of Gaulish mythology has been lost in comparison. It is my understanding that ReDeus will continue. So I hope to have an opportunity to return. I understand your anthology, which you edited and contributed to, is launching this August. Congratulations! Could you tell us what it's about? Phil Giunta: I am so very proud of this. In 2011, I asked Steve Wilson if he would consider publishing a collection of SF, Fantasy and paranormal stories written mostly by as-yet unpublished writers. I had specific people in mind, some of whom started in fan fic, but had gone on to write original material. They just needed an outlet. My hope was that Firebringer Press could provide that opportunity. Steve and I would also contribute tales, along with fellow Firebringer author Lance Woods. The plan also called for one illustration per story provided by Allentown artist Michael Riehl, who would also create the cover art. Steve agreed on the condition that I serve as editor. 2012 was spent gathering and editing stories and writing three of my own. It was a wonderful experience and I could tell immediately that we had something special building here. We ended up with 13 fantastic stories from 8 writers. The manuscript was submitted in February 2013 and accepted in October. The artwork is nearly finished as I write this, and Somewhere in the Middle of Eternity is set to launch at the Shore Leave convention on August 1 in Maryland. I love your blog, Phil, especially the blurb paragraph about what you'll find and then all these COOL links. How did you come up with that? Phil Giunta: Thank you! Well, when I started my blog back in 2010, I simply needed material. I started with author interviews (including many of the aforementioned writers) and book reviews as well as SF convention news and announcements about my upcoming publications. Of course, I still do all of this, although the author interviews have dropped off a bit. Those will pick up again as part of promotion for our anthology. At one point, I noticed that fellow GLVWG member Jon Gibbs had a feature called “Interesting blog posts about writing” each week on his blog. So, I stole the concept from him. Hi, Jon, hope you don’t mind! I began scouring the interwebs for cool articles about the craft of writing, the business of publishing and the controversies that occasionally erupt (as when Joe Konrath takes someone to task or a vanity press like Author Solutions is caught fleecing writers...again). Now, the collection of cool articles has become a weekly routine, though it’s potluck as to which day I post them. And last question... so what's next on the docket for you? Phil Giunta: I have a novella-in-progress that will detail the first manifestation of Miranda Lorensen’s psychic-medium abilities when she was six years old. I consider it her origin story. The second draft is currently finished and awaiting revisions. My medical SF story “First, Do No Harm” was accepted into a digital anthology called Local Magic by Antimatter Press. It is their first publication and is due out in Spring 2014. I’m just starting to outline a SF novel regarding the journey of a generational ship, carrying the survivors of a dying Earth, across the galaxy in search of another habitable planet. 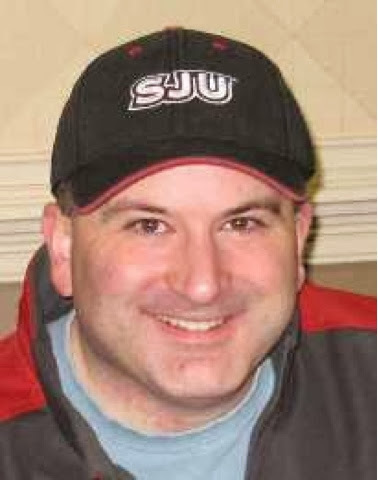 A Pennsylvania resident, Phil Giunta graduated from Saint Joseph's University in Philadelphia with a Bachelor of Science in Information Systems and continues to work in the IT industry. His first novel, a paranormal mystery called Testing the Prisoner, debuted in 2010 from Firebringer Press. His second novel in the same genre, By Your Side, was released in 2013. Phil has also narrated the audio version, available in podcast episodes at Prometheus Radio Theatre: http://prometheus.libsynpro.com. In August 2012, he was among an exclusive group of authors selected to participate in Crazy 8 Press's new venture, ReDeus, a collection of anthologies depicting the return of all the world's mythological gods. The series was created and edited by veteran authors Bob Greenberger, Aaron Rosenberg, and Paul Kupperberg. Phil's short story about the Celtic gods, “There Be In Dreams No War”, was featured in the premiere anthology, ReDeus: Divine Tales. He followed up with “Root for the Undergods”, a tale about the gods of the Gaul Empire in ReDeus: Beyond Borders. Phil has recently finished editing an anthology titled Somewhere in the Middle of Eternity for Firebringer Press to be released in 2014, and is currently working on a paranormal thriller.